Rothenstein uses aspects of art brut as one of her means of expressing the most intense emotions. She also seeks to recapture something of the emotions behind paintings by other artists that move her. These influences are diverse and many-layered, from poetry and photography to primitive art: they encompass the works of artists such as Edouard Vuillard, Vanessa Bell, Georges Braque, Henri Matisse, Modigliani, William Scott, Milton Avery, and the self-taught artists Alfred Wallis and Bill Traylor. She feels somehow emotionally and stylistically closer to those untrained artists who work outside the cultural mainstream and she shares with them the quality of timelessness that emanates from their own personal, and sometimes isolated, worlds. 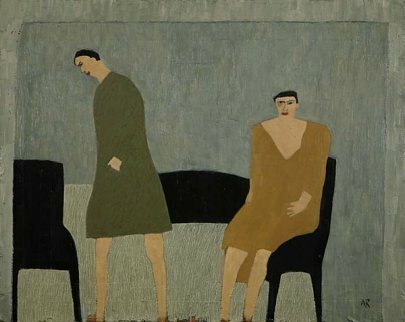 Born in 1949, Anne Rothenstein is virtually self-taught apart from a brief period at the Camberwell School of Art in the late 1960s. She comes from an artistic family background which has obviously informed and influenced her work, and grew up in the community of artists in the Essex village of Great Bardfield. Her father was the late Michael Rothenstein, the print-maker, and her mother is Duffy Ayers, the painter. Her grandfather was William Rothenstein who ran the Royal College of Art and served as an official British war artist. Her uncle, John, was a Director of the Tate Gallery, and her brother, Julian, is a designer and founder of the Redstone Press. She is married to the film director Stephen Frears and has been painting full-time since 1978.